Can Scoliosis patients take the heat? My adventure with Bikram Yoga. We visited my brother in Traverse City this weekend and it is one of the few places in our state that offers certified Bikram (Hot) Yoga, so I, a devotee of Yoga for over 10 years, thought I should try it at least once. For a long time, I thought “no way will I try that – insanity!”. But, one of my yoga instructors told me that I should do fine and that she really liked it and I felt encouraged to at least give it a try. (Of course, the other instructor told me it can make people sick, but I guess I didn’t listen to her). Bikram Yoga is 90 minutes of 26 poses performed in a 105 degree room, at 50-60% humidity. Yikes. It’s the extreme sport of the yoga world, for sure. One celebrity after another will tout it’s praises, and many people claim it cures all sorts of ailments – some scoliosis patients have claimed improvement from this form of Yoga. My husband joked, though, that I should put my cell phone next to my matt, dial 9-1…and then all I’ll need to dial is 1 and “send” should I feel the need. 🙂 It was funny at the time, but proved to be pretty true. I have to say that as far as Yoga studios goes, the Traverse City studio was great – clean, friendly, efficient, affordable. I don’t want any reader to think that the opinions and experience I had are any reflection on the quality of this studio – they seem to run an upstanding business. In summary, Bikram Yoga is NOT for me. It was my first and last time doing it. And, I don’t think it’s great for Scoliosis patients. That is just my UNPROFESSIONAL opinion!! The heat was nice for my muscles, but I actually had a flareup of Sciatic pain that I haven’t had in years that very night and was extremely tired and weak the rest of the day. I assume that would lessen over time and that I would get in better shape, but there are other ways to do that without feeling like you are literally walking through the fires of hell for 90 minutes. My advice would be to be cautious – if you have Scoliosis, work with an instructor who knows what that means, who recognizes that Bikram isn’t a magical cure for every body (that a Scoliosis spine is created differently from other spines) and that will not pressure you to go further than your body wants. I firmly feel that one needs to be very careful when doing such intense Yoga moves and take it slow. I’m happy to say that I could take the heat, but won’t choose to do it again. Namaste. This week’s adventures have been plentiful – the last few weeks of school are very busy with my husband’s job, field trips, award assemblies, etc – plus my daughter and I are going to be in another community theater play in July. We auditioned for “A Little Princess” through one of the local community theaters and I got the part of the mean and nasty Miss Minchin – my daughter will be one of the Pupils (Ermengarde). We laugh because we’re both playing opposites – my character is mean to little girls and my daughter’s character hates to read and is horrible at spelling. My daughter took 3rd place in the county spelling bee! 🙂 Seriously, though, another adventure we started this week was voice lessons. My daughter is very musical (wonder where she gets that?) and she’s been singing in the choir I direct at church. She has good tone and an ear for pitch..she also has a 2 octave range! She’s thought about playing the violin (like me), but I can attest that it is not a skeleton-friendly instrument. When we went to do our week with the Schroth therapists in Wisconsin, she said that one way to prepare a younger child for Schroth is to encourage them to play wind instruments. Of all the instruments I’ve played, I’ve never played ANY wind instruments – Except for the wind instrument that is always handy – the voice! Since I know a wonderful voice instructor in the area, I proposed the idea to my daughter and she loved it – her first song selection will, of course, be by Taylor Swift. During her first lesson we learned about the anatomy of the windpipe and vocal chords, she spent time thinking about and discussing proper posture, and started breathing techniques. All of this was masked as FUN! So, I’m really excited about her being able to partake in an educational, fun, and Scoliosis-friendly activity like this. And, sitting in on the lessons is educational for me, too. I would encourage everyone out there to take a minute to think of how you can bring the fine arts into your already hectic lives – not only does music build mathematics competency, but there may be physical benefits that you’ve never considered! Plus, singing a great song just makes you happy! Have fun singing this week. Yesterday I went for my first Awareness Through Movement (ATM) Class at a nearby Feldenkrais practitioner’s office (Suellen Bartel at www.revitalizeyourself.net). I contacted Suellen after I heard about the Feldenkrais technique from a fellow blogger and Mom (at www.sticksandrocks.blogspot.com) Anyway, after hearing how her 5-year-old son got results after just one session with a Feldenkrais instructor, I thought it would be beneficial to look into it. I was VERY surprised that there was a practitioner within just a half hour from my remote location. It takes that long to just get to a grocery store, so this was very good news to me. And, she was offering a week of free classes, so it was the perfect opportunity for me to go and find out what it was about before I get my kids evaluated. When I got to downtown Bay City, I had a bit of trouble finding the studio, but knew it was near the Jimmy John’s sub shop, so I spent some time walking around a bit. I noticed that it was also next to a YMCA. I saw two very fit women walk by and figured they were going to the Y. Then I saw a woman walk by who was clearly having trouble – she was bent over and she walked with bent knees. I figured she might be headed where I was headed, but I looked around a bit more before I located the building and found the small studio on the third floor. Inside, the area was very calm – there were mats on the floor and the lights were low. Suellen greeted me at the door and we shook hands. I knew from a previous email conversation with her that she overcame a lifelong, crippling struggle with Arthritis, and that the Feldenkrais technique helped her get moving and get her life back. While I noticed a few signs of the arthritis, she was vibrant, happy, and moved around very well. And, as I looked around, I noticed not only the one woman that was struggling on the street, but the two fit women that I thought were going to the Y, as well as some other people relaxing on pads on the floor. After Suellen gave us a brief history of the technique (which I’ll get into in a minute), and after we introduced ourselves, we spent the next hour exploring our bodies in a way I thought was very simple at first. Frankly, I half-slept through most of it. But, when we got done, boy did I notice a difference! Suellen purposefully left us uneven – we only worked one side so we could see the difference that the technique made. I wish I could tell you what that difference was, but although it was apparent, it is difficult to put into words. I do a lot of yoga, and Suellen said that some studies show that people are more elongated after a session of Feldenkrais than after a session of yoga. I have to say that is true for me. However, there are many, many more benefits to yoga than elongation, but I could see her point – I felt extremely relaxed, yet more revitalized at the same time. My right side felt freer, my breathing was much deeper and more natural, my anxiety from the week diminshed greatly. And, the lone woman from the street – the one that was having trouble walking – she asked to talk to us “newbies” when she introduced herself. She asked us to take a good look at her, and then look at Suellen so we could see the “before” and “after” shots. She has hope that she will be that “after” shot one day, and I hope that for her, too. The basics of Feldenkrais: the Feldenkrais Method is an educational system that connects learning with human health and function. Yeah, what does that mean? Well, what it meant to me is that there are many, many lessons put together by Moshe’ Feldenkrais (the founder of the technique) – more than a 1,000, to be specific – and the purpose is to explore everyday actions (reaching, turning, bending) through those lessons, and re-learn what we learned as children – how to use our bodies to do these everyday motions at peak efficiency. The technique involves a lot of concentrating on intricacies of the skeleton and muscles and how it all works together. Still, it doesn’t seem that clear, but it’s one of those things you truly have to experience to believe. Now, in relation to Scoliosis, I will have to keep you posted – I will be setting up a consult that my husband and I can both go to where Suellen will discuss what she feels can be done with our kids. There are You Tube videos to watch, a DVD to research, a book I can read – all these things will take precious time, but I feel we may have stumbled onto another therapy for our arsenal. The good thing is that Feldenkrais practitioners prefer to work with younger people – to overcome poorly learned habits earlier. Whereas, the Schroth Therapists perfer NOT to work with younger kids because the therapy can be too confusing. So, it may also be something to do sooner rather than later until the kids can handle a more intense therapy. Either way, I will, of course, keep you posted. If you have experiences with Feldenkrais, please share a comment so we can all learn from you as well! Adventures in class field trips. This weekend I told my husband I would not discuss the business or Scoliosis, or anything – I just want to live a normal life for one weekend, catch up on some home stuff, and enjoy my Mother’s Day. We started this on Friday when I attended my daughter’s class trip to a Dinosaur Exhibit at the Midland Center for the Arts in Midland, Michigan. My daughter is a very girly girl, but I have to say, she knows more aboutt Dinos than I ever have or ever will. She loves them. 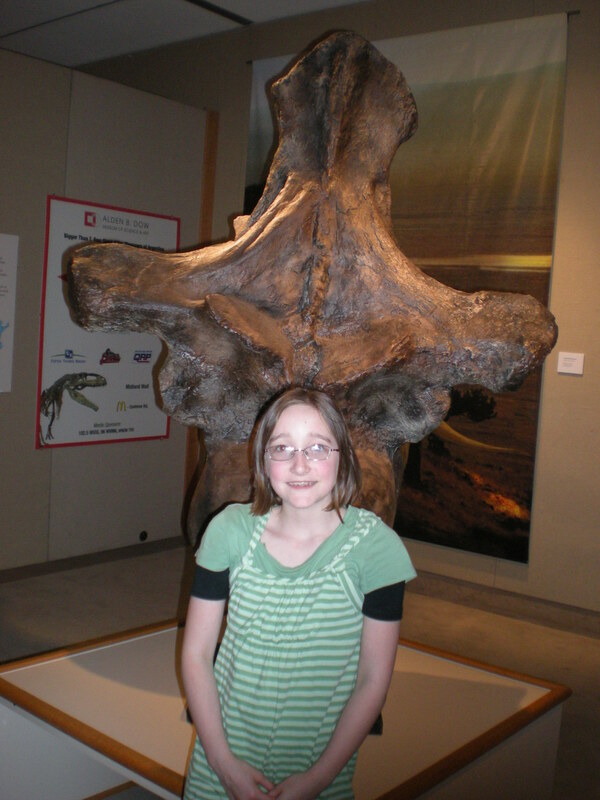 She even has a favorite dinosaur (the parasaurolophus). She watches science and nature videos for fun, and retains a lot of the info. So, she had fun. It was tough for me to carve out the time to climb on that bus and spend the day with a bunch of giggling 4th graders, but it was totally worth it. My Mom was always working and never had the ability to go on things like field trips with me. On one hand, it made me very independent, but it would have been nice to have those memories with her. So, I hope my daughter will not only remember me for all I do for her and how hard I work to help others with Scoliosis, but also for these small moments, shared together – just a normal day for most, but a Memorable Day for us. Enjoy your week – try to make some memories. And, Happy Mother’s Day to all the Moms out there working hard to make a great life for their kids! Imagine the size of the Scoliosis brace on that spine! This vertebrae was from a Dino that was 3 stories high!